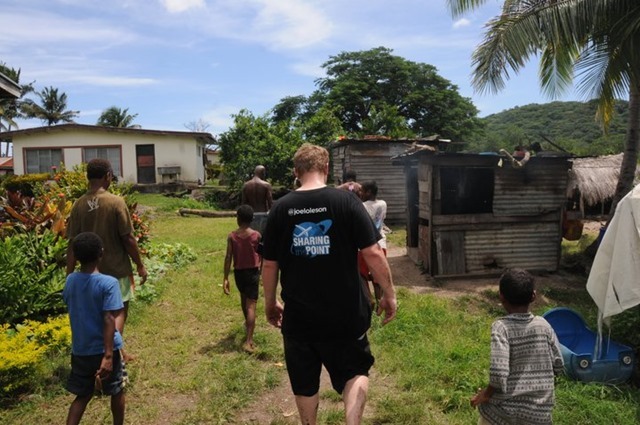 I bought a cheap flight from New Zealand on my way back to the U.S. On a discount Jet Star flight, I was in Fiji for a couple of days for less than a difference of somewhere between $100-200 USD. It was great. 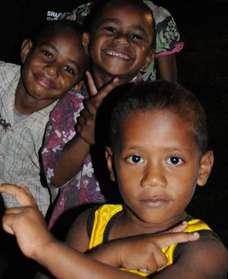 I loved Fiji. The people were amazing! The adventures I had in Fiji could not have been planned, and no guide could have planned some thing as authentic as what we experienced. This post is the first night and I’ll separate the other experience in another post. Fiji was just too amazing for one post. Michael condensed his into one post on Fiji titled “Kava Shots and Holi Wars”, and I borrowed a couple of his great photos. 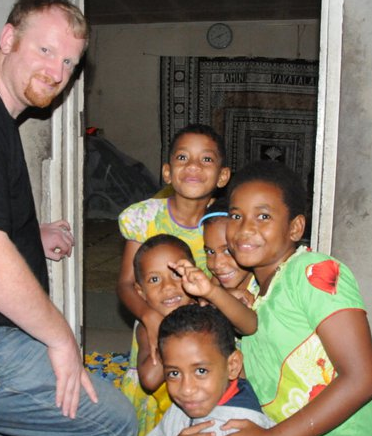 This post on our experience with the native Melanesian people and my second post on the hindustanis and celebrating “holi” with them. When some people think Fiji, they think of beaches in paradise. I was thinking… Natives in grass skirts, a real tribal experience that I couldn’t find in the Caribbean. I knew I wouldn’t have my wife and kids with me, and hanging out on the beach was the furthest thing from my mind. I wanted to go local and seek out a real adventure. On the flight to Fiji I asked a flight attendant where I could find the most native village and one where I could live with the locals. I was imagining huts or sleeping on mats or hanging hammock. I was given the name of a place somewhere deep in the island. When we went to pick up the rental car, they said we’d want a 4×4 to get there. Ultimately we picked up a 4×4 and headed out into the woods. Before we headed out, we wanted to make sure we had a gift for the village to cover any expenses we might incur to the village. It was long before we started out on dirt roads, and deeper and deeper crossing rivers, and getting strange looks. Miles and miles deeper we drove. The stares started getting longer and polite “Boolah!” we would get. We’d respond, “Boolah!” and smile big. Then someone stopped us… where are you going? We explained we were going deep into the heart of the island to this very native village. He told us that was impossible and that we should turn around. We let him know we weren’t in a hurry and were enjoying the drive. He gave us a warning that the river had washed out the road. It got more and more challenging as we drove along and finally we met our match. The road was too much, so we turned around. You’ve heard about Anthony Bourdain and his No Reservations show. On this day we were definitely traveling without reservations. We were both up for adventure. I was traveling with my friend Michael Noel of SharingTheGlobe.com and I said. Tonight I want to sleep in a village, and we agreed even if we were on someone’s floor. We were open to adventure. As we drove back the way we came, we saw a big tent and a local gathering. We slowed down to avoid the crowd walking along the street and gathered around the tent. Young men were pounding long metal pipes in little wooden canisters. They’d lift and pound, twist lift and pound. We slowed and said “Boolah!”… What’s going on? He replied, it was a birthday party for his 1 year old daughter. The entire village was gathered for the party. The women were inside the home, and the men underneath the tent. He invited us to join them. We had heard about the need to bring cava roots as a gift, so we were prepared. I was so excited to join this exciting moment and the family was happy to have some foreign guests of honor. We were brought to the head of the tent to the elders of the village and sat down on mats. 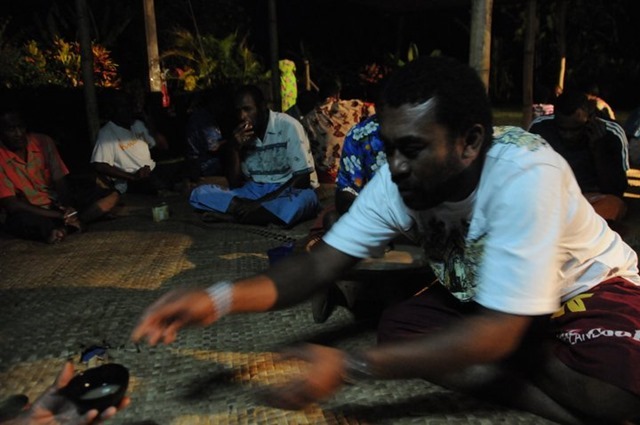 The village chief elder asked us a few questions, but invited us to participate in a ceremonial “Kava” drink. 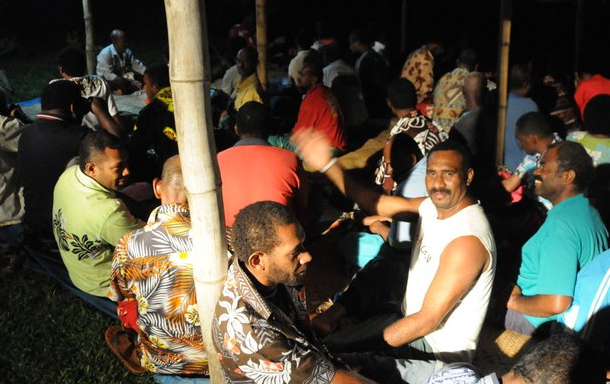 Kava is such an important part of the culture. It is only consumed sitting with your legs crossed, with no legs and foot pointing to the sides. The kasava root is pounded then put in a sock and water is added to create the drink. The first person claps their hands twice, and from a large bowl a half coconut is dipped in and then the person who is presented the cava claps twice, then drinks the cava, after he’s finished he throws any remainder over his shoulder and hands the coconut back. Both hands are used at all time. It felt like a handshake, trust, confidence, and an opportunity to make friends all at once. The tent was filled with happiness and order. Those with the most age were at the front of the tent and as a rite of passage, you had to be twenty or twenty one to enter the tent. Those at the back of the tent had paid their dues in the pounding of the cava and only those who had come of age could drink the cava. In our search for a unique cultural experience we were given one. We had arrived late to the party and the men had already eaten. We were invited to eat with the women and children who as custom would have it, eat after the men. They accepted us and we had some interesting looks, but had some great local hand cooked fish and rice. The children thought we were interesting or funny looking. Either way, we made friends with the kids, and eventually re-emerged back out toward the tent. A couple of younger guys from the back of the tent approached us and asked us about our story. Why we were here, asking if we were having a good time… Of course we were. We were offered more kava. At this point I was getting a little nervous. I wasn’t sure if I was going to have strange dreams or what affect this kava might have. I knew there wasn’t alcohol in it, but beyond that I didn’t know much about it. I explained to the young man that I shouldn’t have too much. He asked why. I said for religious reasons. He asked what religion. I said. LDS. He said. “No way.” I said, “yes way. I am a Mormon.” He replied… That was impossible. He stopped and said. I am a Mormon. That house over there. They are Mormon. Many in this tent are Mormons. I wasn’t sure if he understood me, or what, but then I remembered as we had turned off the road, I had seen an LDS church. 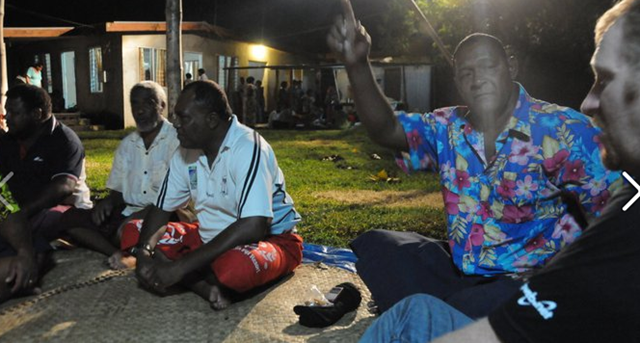 He said the prophet had told them that they could drink kava, but they should not drink too much. Having spent the last 3 hours involved in the ceremony with the elders I could see the cultural importance, and for a young man this was a huge privilege for him to be under the tent and mingling with the men of the village. He asked us where we were staying and I told him we were hoping to find a place to stay. A while later he told us he had talked to his mother and we could stay with them. Perfect! We would be able to stay in the village and even if on the floor we had a real local experience rather than staying in some cheap hotel. He wanted to stay at the party as late as possible, so I asked him about what time he’d be leaving. He didn’t know, but somewhere around 1am. We agreed that would be fine. He ended up going back to the party after we settled down for the night. The 1 year old’s party lasted till at least 2 or 3 am. Wildest 1 year old party I’ve ever heard of… The people celebrate together. It’s a very communal society. Music got more lively and ultimately it turned to dance, and we were invited to boogy. After learning a few local moves, we were invited by some locals to start dancing. We had some more kava. Danced some more. 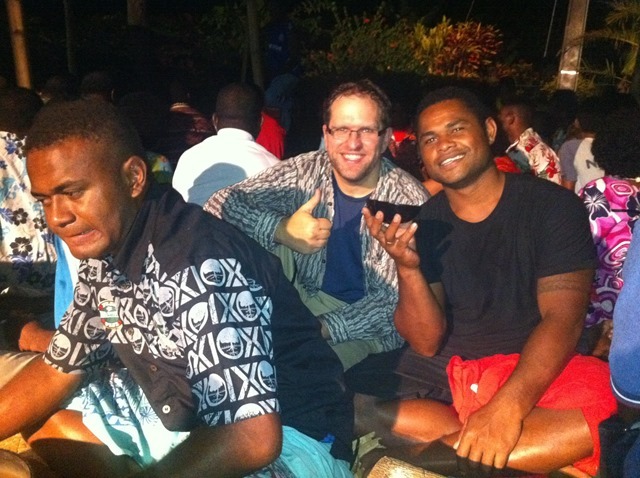 Had more kava, met more locals and spent the evening having a blast with the local Vatuvu villagers. Fiji was amazing and we were experiencing it raw. No guides, not paid group. Our payment, a gift of Kasava root, smiles and friendship. That night I would sleep on my new friend’s couch, and feel what it was like to be a villager. Mission accomplished!